The fact is the subject line is only a tiny fraction of what you can test. It reaps only a tiny fraction of what you can achieve. There is so much more. Let’s look at the five most effective variables you can test in email campaigns, pulled from a chart in our brand-spankin’-new 2012 Email Marketing Benchmark Report. More often than any other variable, email marketers say testing a campaign’s target audience is “very effective.” What is a variable? It’s a defined part of an email that you can adjust and test, such as the copy, send time, subject line, etc. It can be almost any part of the campaign. I was surprised that 42% of email marketers believe testing the target audience is very effective. But really, I shouldn’t have been. Context is everything. It does not matter what’s in your email or how it looks if it’s sent to the wrong audience. If the message means nothing to readers, then all the personalization in the world won’t save you. 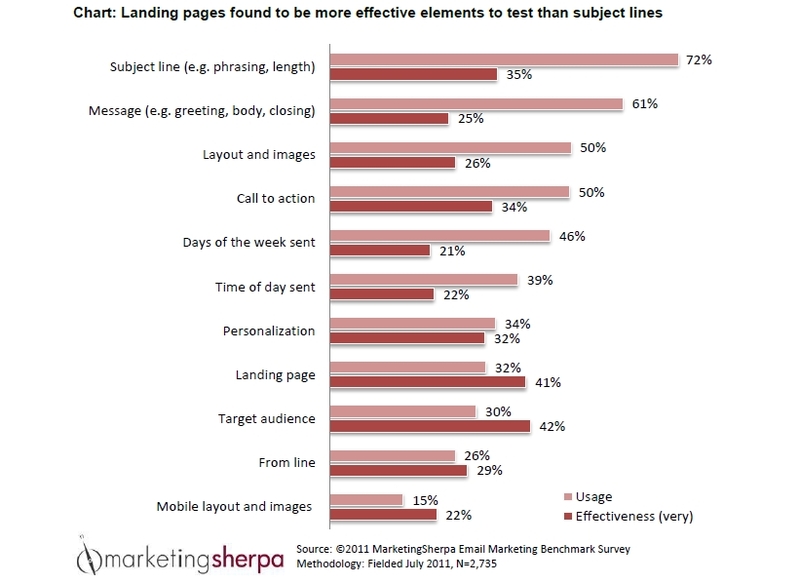 Yes, the second most-effective variable is not even part of the email — it’s the landing page. And with 41% of email marketers saying it’s “very effective” to test, the landing page is nearly as important as the target audience. You’ve likely seen it yourself. The conversion rate suffers anytime the landing page does not reinforce the email’s message or style. Finally, we’ve made it to subject lines, the most popular variable by far with 72% of email marketers testing them. Note the six-point drop in effectiveness compared to variable number two. With 35% of email marketers saying they’re “very effective” to test, subject lines should be on your radar, but they should not take up the entire screen. Adding a personalized “Hello John” greeting is an old standby in email marketing. Many companies do this because it works, and 32% of email marketers say testing personalization is “very effective.” Personalization can go much deeper than simply using a first name, though. You can include information about the recipient’s products or services, location, interest and other info. Do you have the right priorities? Take a look at the disparities in the chart. Variables such as the message, layout and day-of-week have greater-than-20% differences between the number of marketers testing them and the number of marketers saying they’re very effective. If you haven’t tested one of the top-five variables listed above, and you’re bogged down testing something else, then consider shifting your focus for a test or two. And if you’ve tested only subject lines for months and months, try stepping out of your comfort zone. You might like the results. I write Design Tips and Life style Tips for major home furnishing retailers. We are actually a micro site. I am interested in How to Get my Open Rate up? Once they open the page 96% read the tip. Any thoughts on how to get them to open the page. granted, we are dealing with a very specific targeted customer. Hi Lynn — Thank you for your comment. I am a humble reporter, but I will offer the best advice I can. People only click if they perceive a benefit from doing so. You have to convince people that they will receive value from opening your emails. If too many of your emails are irrelevant or do not provide value, then you will train your audience to ignore them. My advice is to identify something this audience wants and that you can deliver via your email program. Make sure it’s relevant to your brand and strategy, and then send it to them in every campaign.